FamilyFarmed‘s Good Food Festival & Conference reflects the values of the Good Food movement: increasing access to food produced locally as possible using sustainable, humane and fair practices, to build a healthier, more sustainable and more economically dynamic food system. It also reflects the amazing diversity of this nation’s food and farm entrepreneurs, both demographically and in the types, styles and ethnic origins of food they produce. Here are four examples of the businesses you will find in the Exhibit Hall. The “Chutney Devis” behind this one-year-old company’s delicious Indian chutneys, mixes and spice blends are Uma Vaiyapuri, a former IT engineer, and Vineeta Santoshi, who works in concierge services. “Devi” is the Sanskrit word for “goddess,” so it’s not a far stretch to say the food prepared by these longtime friends is heavenly. Attendees at the Good Food Festival will get a special treat, because the Chutney Devis are introducing a brand new product: kitchari, which they describe as Indian soul food. Their proprietary mixture of rice, lentils and spices requires the addition of only a tomato to make a delicious meal of vegetarian comfort food. 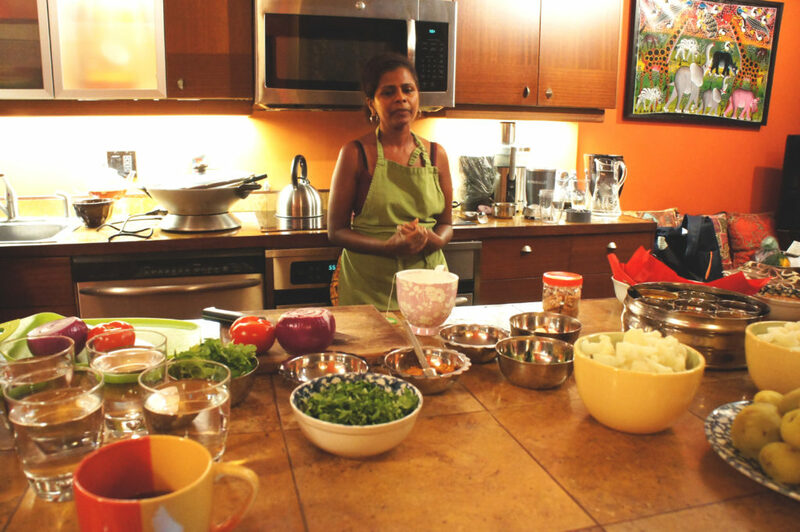 Rice and beans are staples in south India, Uma’s home region — Vineeta is from the north — and Chutney Devis’ food is focused on that region, in part because Uma is the chef and in part because south Indian cooking is generally underrepresented in the U.S. marketplace. 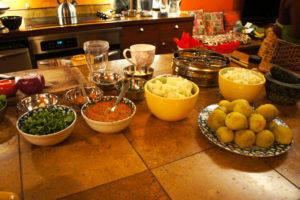 During a cooking class that the Chutney Devis staged in Chicago on Jan. 28, Uma asked attendees about the Indian dishes with which they are familiar, and the responses — such as tandoori chicken, chicken tikka masala, samosas, chana masala and aloo gobi — were all from northern India cuisine. South India leans more toward vegetarian dishes, and is probably best known in the U.S. for its dosas (a Chutney Devis specialty), which are rice crepes with meat or vegetarian fillings. 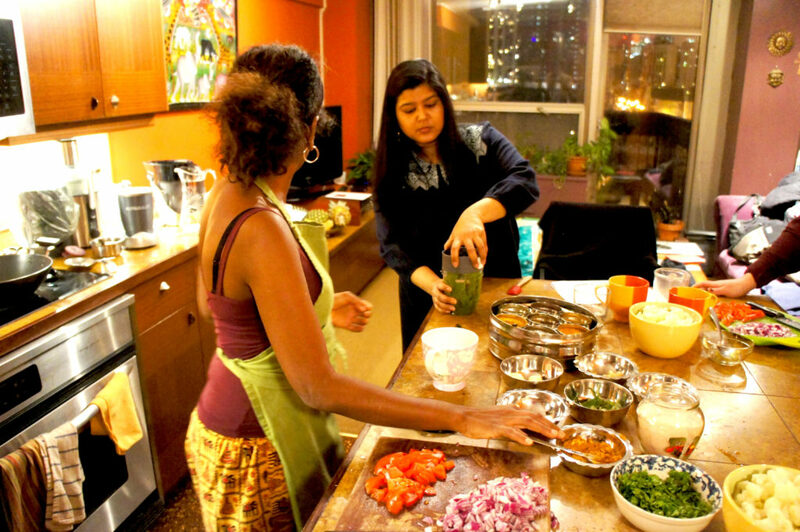 “All that you have experienced is a teeny, tiny portion of Indian food,” Uma said. She noted that her cupboards have seven or eight different kinds of lentils, and that Chutney Devis’ curry powder is her family’s own blend. 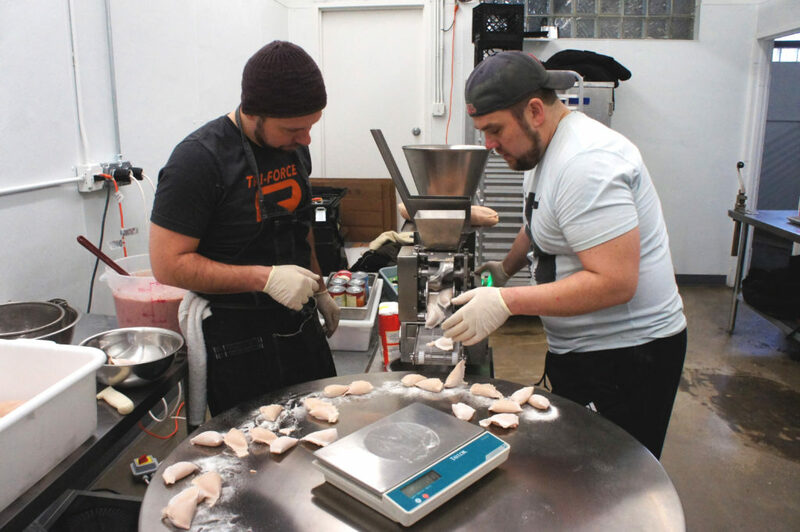 The “Chow” in The Chow Brothers is a shortened version of Chris and Mark Chowaniac’s last name, and the food they produce — pierogi dumplings and fermented foods such as sauerkraut — are steeped in the traditions of the Chicago area’s large Polish community of which they are part. Chris attended the International Culinary Center in California and is a professional food photographer. 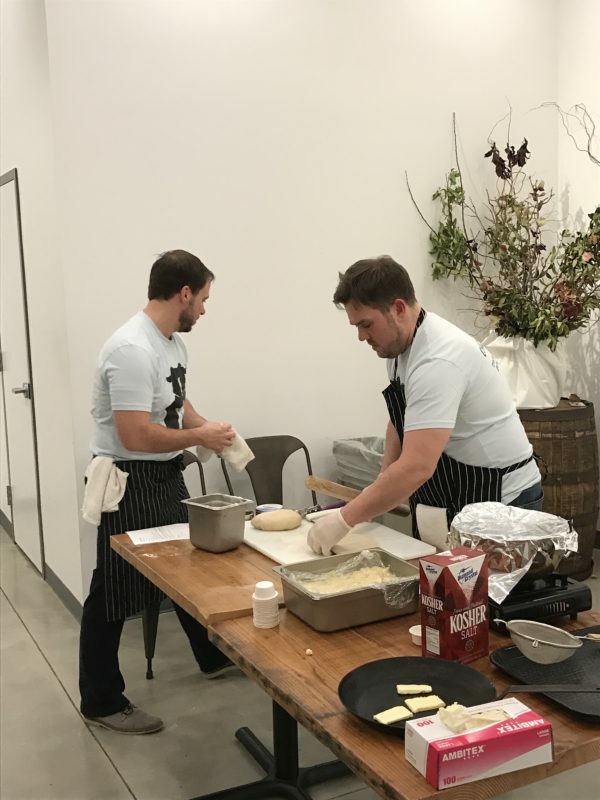 Mark initially worked in software sales and development after attending Northern Illinois University, but also moonlighted in restaurants and working as a private chef. 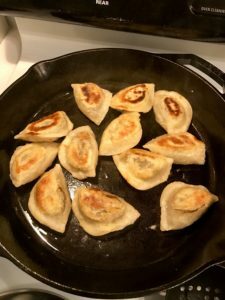 Five years ago, they created The Chow Brothers to channel their interest in Good Food through their family’s Polish traditions. 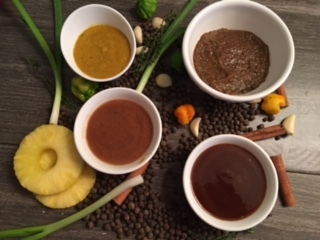 Hellshire Foods produces sauces and seasonings “inspired by the art of Jamaican cooking,” making small, handcrafted batches. 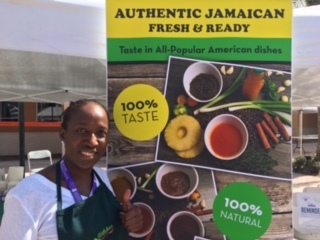 According to the company, “We work with small local farmers in Florida, Jamaica and vendors to ensure quality gourmet products for your culinary use,” and describe their products as farm fresh, locally processed and responsibly sourced. Raising grass-fed, pasture-raised livestock is a tenet of the Good Food movement, and increasing numbers of consumers across all boundaries are supporting that concept — not only in the meat they buy, but in the dairy products they use as well. So Grass Fed Gourmet, which specializes in a gourmet spread it calls CocoGhee, is an apt fit for FamilyFarmed’s Good Food Festival. This entry was posted in Community kitchens, Ethnic foods, Fermentation, Food Artisans, Food Entrepreneurs, Good Food business development, Good Food Festivals, Good Food movement diversity, immigration, Value Added Products and tagged America's diverse foods, Chutney Devis, chutneys, CocoGhee, Ethnic cuisine, FamilyFarmed, fermented food, Good Food Festival, Good Food Festival & Conference, Good Food Trade Show, Grass Fed Gourmet, grass-fed livestock, Hellshire Foods, Indian cuisine, Jamaican jerk cooking, kitchari, pierogis, Polish cuisine, Polish cuisine in Chicago, sauerkraut, South Indian cuisine, The Chow Brothers. Bookmark the permalink.